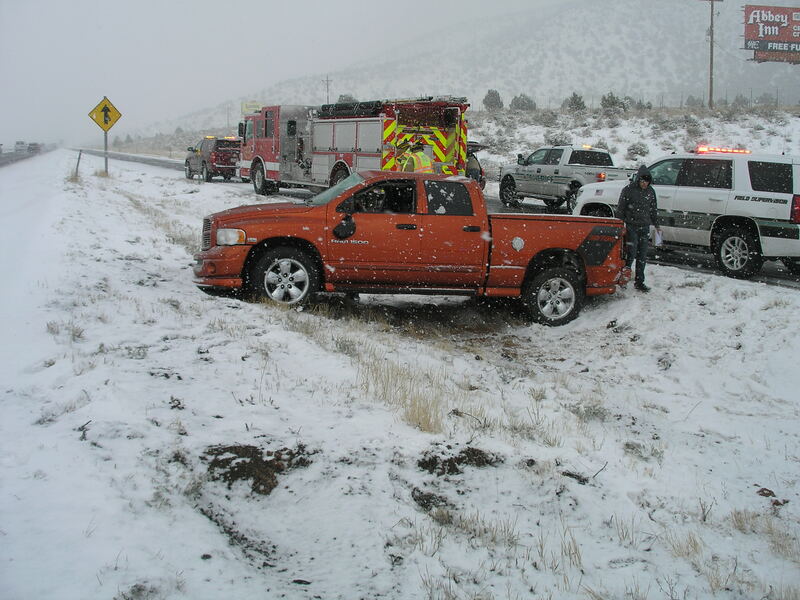 CEDAR CITY – Officials reported a family of five all safe Friday after rolling their Dodge Ram 1500 Crew Cab on Interstate 15 during a snowstorm that had several vehicles sliding off the road. Utah Highway Patrol Lt. Steve Esplin said the fact the occupants were wearing seat belts saved their lives by preventing them from being ejected. “This is news,” Esplin said. “Too often we have to report the opposite, that five people are being transported to the hospital for serious injuries because they didn’t wear their seatbelts,” he said. The crash occurred around 3 p.m. near mile marker 51 in Iron County when the driver of the truck, who officials said was allegedly driving too fast for the conditions, starting sliding off the Interstate after making a lane change. The truck then reportedly sideswiped another vehicle at which time it then rolled into the median, Esplin said. The driver was cited for driving too fast for conditions and improper lane change, Trooper Brian Bairett said. Come on the posted Speed Limit is 80. Got four-wheel drive? Hammer down! Seriously, made a trip to Richfield and back yesterday. Very nasty at times with fog, snow squalls, wet and slippery roads. Does that slow down the idiots – No Way!